Oh and have a VERY scary game found from Jay is Games PLEASE this is NOT suitable for anyone of a nervous disposition, or children. this evening I got home to our cat walking better than ever. I do worry about him and wish I could spend more time at home. He is proving to us that he’s getting better and trying his very best to get well. He’s still limpy but at least knuckling less and standing better on his back legs. He’s always fun and purring lots and you can see in his eyes that its slightly frustrating but not going to stop him being happy. In other news last night our neighbours were home and forgot that they were in a terrace. The bass on their music was LOUD and we waited until after 11.30 before I got up and went next door and very kindly requested the turn it down before I use my dpns as stabby things. I was polite but informed them that somehow they were managing to get the bass right up the partition wall, and really a monday night? PLEASE I’m nearly 30. I prefer not to be shaken in my bed after 11 on a week night because you’re still a stoodent. Anyehew they were nice about it and turned it down. Then when leaving 30 minutes later managed to slam the front door and the car doors and rev the car engine. Then the builders started at 7am breaking bricks, mixing cemet, and cicrular sawing breeze blocks. Saying all that though we’ve been here nearly a year and thats the first time ever I’ve really been annoyed enough to want to crack out the knitting needles for some ninja smack down. 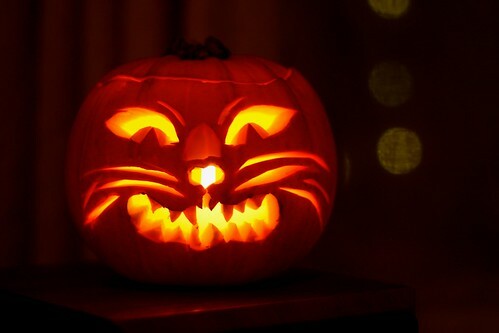 I’ve carved a pumpkin. Scotty has toasted the seeds. I will report back on the seeds and I’m processing photos on the mini pumpkin. I’ve booked another visit to Dragon Hall and Erasmus’s next visit to the vet. I may just get around to some knitting if I get away from blogging and that internet. I’m behind on blogging about things, instead I’m doing things. I finished mums hat without a single photo of progress. I’ve started a cotton bag because the cotton sock yarn was just not wanting to be socks. I cooked a Sunday roast, did the shopping and spent lots of time knitting and avoiding thinking about going back to work tomorrow. BOOOO! I still have tons of stuff to sort out and one day I will get those pics of the camera of the twins the other day, and take photos of mum in her new hat. 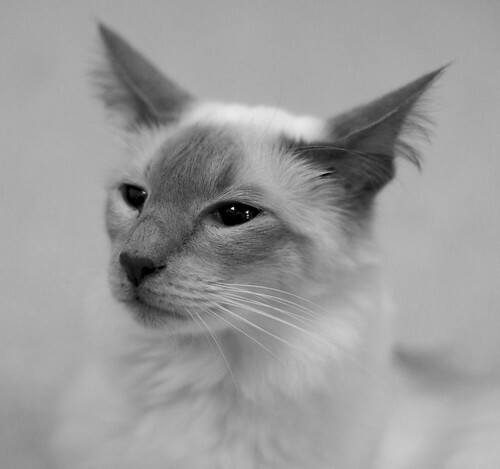 Have a pic scotty took of our darling boy. 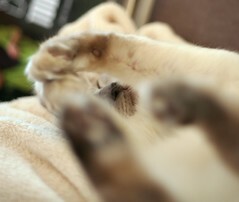 Hopefully you can all see the embedded video and see I am fiddling there with our cats’ faulty back leg. As you hopefully can see he’s not lifting it properly so now he walks funny. Not too much of a problem but for now until he’s very comfortable with his walking I’m not letting him any where near the stairs. Last night was his first night out of the cage which meant less moaning. But of course now he wants more and was moaning to be let out in to the hall way this morning. I’ve given him the hard talk and its all gone in one ear and out the other with a lot of back chat. The essence that is the personality is totally there and back with a vengeance. He’s very much on the mend, its all down to him to stop being so stubborn and try to keep working his leg. Yesterday was great. My brother popped over with the twins. We left Erasmus for a couple of hours whilst we went a long walk down town. The weather was good enough to walk in but not good enough to take photos. At 21 ish months they were great around erasmus and he was wondering between them sniffing them. They were both very very gentle with him. He even sat and ate yogurt near the twins whilst they had a picnic on my lounge carpet. Lazy days are not that lazy. I’m knitting my mum a hat which is just about 30% done. I cooked up a storm yesterday, cleaned the kitchen. Did several loads of washing and swept up. I cooked apple and almond cake which was a success. Also a vegan friendly soup if you change the falafel. chop all, the onion quite fine. add 1/4 tsp of mustard powder and turmeric powder. Stir thoroughly until all veg are coated with oil and spices. before it starts burning and as the onions start to wilt, add enough water to completely cover the veg. Place on lid and stir occasionally until veg are soft and will squish with the spoon. Take off heat and blend, leave to cool a little if it will splash you. Add S&P to taste. I had some cauldron feta and mint falafel which were great floated in the middle. With a side of Irish bread. If its too thick for you, just add more water. Today we have a nurse visit at the vets which will hopefully be quite a lot cheaper than before. so yeah, I’m at home all week. The cleaning is getting done slowly. As its holiday I’m not rushing to do things. 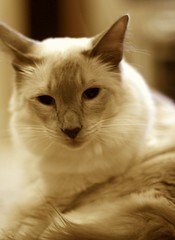 Erasmus had another visit to the vet yesterday and he has a nurse visit booked tomorrow. He is improving although he still limps and walks on his back paw funny curling it round underneath him. I keep massaging him and all warmth is back in his leg. There is still one problem. He does not appear to be eating properly yet. I’m getting close to force feeding in some way. I’m just not sure quite how to go about it. What I have done is got some new yarn from the local store on Cromer road. I managed to pop out for 20 minutes and leave Erasmus sleeping. I bought some Louisa Harding Grace – silk & wool. Its lovely and smooshy and perfect for a hat for mum. Hopefully all this time off will give me time to make her a birthday present before 18th November. My brother and his lovely wife are popping over with the twins this morning. I’m just getting the place sorted to be at least reasonably child proof (who am I kidding). Erasmus will have to go in his cage for a bit because its not safe him hobbling around a pair of running 22 month olds. I feel like I should be relaxing in to my time off, but I’m not. I’ve had to take the only holiday time I had left which means I’m going to have to work the whole Christmas week except bank holidays. A tad frustrating but hey, I’m getting Uber cuddles on the hour from a very happy cat. Plus doing the housework and staying in most of the time is enjoyable, just not exciting like good holidays should be. Erasmus needs home care for a few days. The vet requested we keep him in a cage if we cant supervise him. We cant let him get any bruises because he’s on blood thinners. So at short notice with my boss away I had to try and arrange some time off. Luckily all my work is in hand and in a good position not to worry too much about it. Luckily I had 4 days holiday left to take before Christmas. Even more luckily I seem to have the most understanding and helpful bosses ever. So today I am home with my boy having the rest of the week off, spending as much time as possible with him out of the cage and resting. Last night was difficult, I got a cab from work to the vets and back home again. The cabs cost £15 and the vets bill was £291 after all the extras like the cage. It was painful making Erasmus settle in a new cage but it was for his safety. He moaned for most of the evening but was quiet all night which can only be a good thing. For the moment Erasmus has feeling in his leg because he gets annoyed when I touch it. Its still very very limp and he struggles to walk very far. Apart from this he is still insistent that he can just jump all over the sofa. He’s not eaten much at all and I’ve been shopping and even bought him fresh chicken breast, which I have no idea how to cook because Scotty and I do not eat chicken. I’m yet to see him poo which will be the point that I will believe he is getting really well. So yeah, a whole week on the sofa with the cat I was not sure I would ever see again. how lucky am I? very and it was worth every penny. 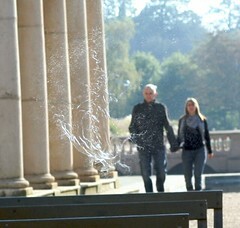 we met up with other flickrites on Sunday and went to Eaton park. The weather was fantastic and our friend Robin brought some bubbles for the kids to play with. ALL the flickrites loved taking photos of the bubbles, you can see more of everyones photos here. I was even lucky enough to get one bursting. Even better we heard that Erasmus might come home on Monday night. You are currently browsing the Jiva a soul in transit blog archives for October, 2007.